Dr. David Wise, coordinator of the National Warmwater Aquaculture Center and Steve Pomerleau, general manager of America’s Catch Catfish Farm, Inc., discuss upcoming vaccine trials. Photo by Kenner Patton. Passion is a large determinant of success. And that passion exists within Dr. David Wise and his staff at the Thad Cochran National Warmwater Aquaculture Center. Located at the Delta Research and Extension Center in Stoneville, the Center’s mission is to provide solutions to the most pressing problems faced by producers in the aquaculture industry. This is achieved through research, extension, and diagnostic services with an emphasis on production efficiency and health management. The Thad Cochran National Warmwater Aquaculture Center includes four distinct units: the Mississippi Agricultural and Forestry Experiment Station, the College of Veterinary Medicine, USDA Agricultural Research Service, and the MSU Extension Service. This arrangement provides a wide range of resources and areas of expertise to solve complex issues. Program areas include diagnostic and clinic research, fish health management, production system development, nutrition, water quality, and genetic improvement of fish stocks. The goal of the program is to identify factors that generate the greatest return to farmers. 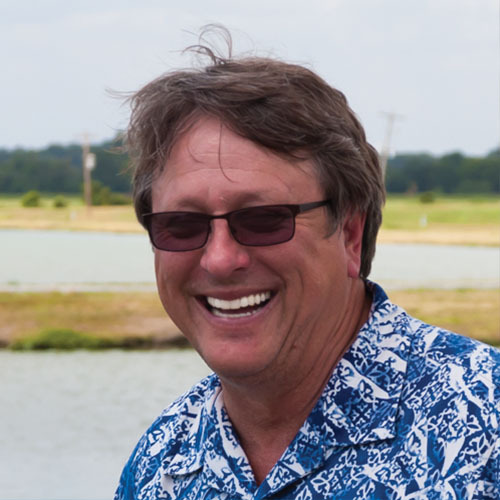 Wise, who has been an Experiment Station scientist since 1993, works in the area of fish health management and coordinates the aquaculture program in Stoneville. “Fish health, based on farm research, has a huge service component to it. Because of this interaction with the local producers, we are able to develop a working knowledge of management constraints and immediately identify issues or problems that are impacting fish health or production efficiencies,” Wise said. The Aquaculture Center’s primary focus is helping producers increase production and economic efficiency. 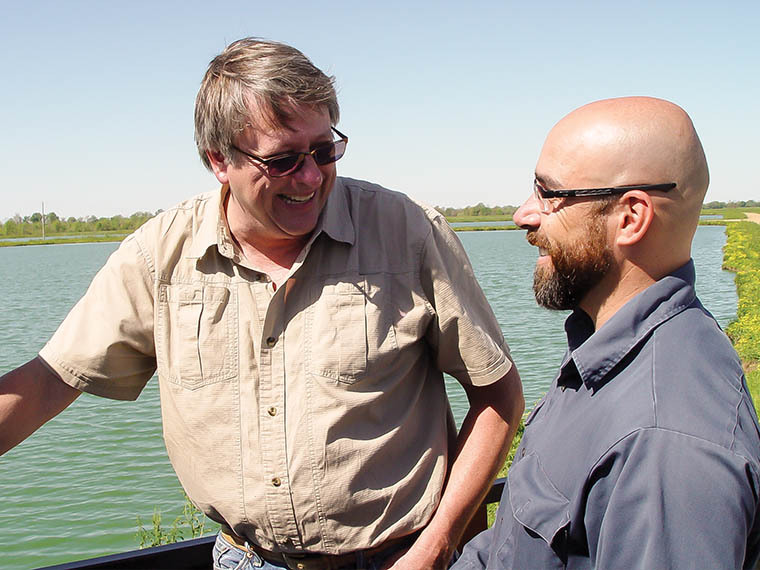 This interaction allows us to understand catfish management from the farmer’s perspective. Sometimes we identify problems after being called for a site visit or while in the middle of a farmer’s ponds working on an unrelated issue. After a problem is identified, scientists at the Aquaculture Center develop a theory that is related to a specific concern and test the theory experimentally. From there the concepts are validated in experimental pond trials or directly on farms. Wise and Pomerleau discuss the general operation of the vaccine delivery system which is a state-of-the-art mechanism that NWAC has in their array of tools that help farmers remain profitable while at the same time assist the researchers in furthering their studies. Photo by Kenner Patton. One of the greatest assets for NWAC is that it is located in the middle of catfish country giving it a high level of visibility in the industry. Oftentimes, scientists can resolve problems and deploy solutions developed in the laboratory directly on the farm, producing almost instant results for the producer. Many real-time factors determine if follow-up research is conducted in research ponds or in a commercial environment. Sometimes these conditions cannot be replicated in a research pond, thus creating the need to go straight to the producer to be evaluated on-farm. In many research environments, once a possible solution is reached, the effort stops there and it is left up to the industry or the farmer to determine how best to utilize the information. That’s not the case with the Aquaculture Center. When scientists discover a solution, it is often pushed out to a commercial operation in a timely fashion. “This unique arrangement would not be possible if we didn’t have very good working relationships with catfish farmers. We set up a research situation on a commercial farm which becomes a co-managed demonstration/research project. That validates the procedure or treatment recommendation and leads to the development of best management practices. From there the solution is communicated back to the Aquatic Research and Diagnostic Laboratory at the Aquaculture Center so the information can be relayed to other farmers experiencing similar problems. Aside from scientific journals, information is also shared with other producers by participation in extension workshops and publications or by word of mouth among farmers,” Wise said. A good example of the Center’s problem-solving capabilities is catfish anemia. Catfish anemia, also known as ‘white lip’ or ‘no blood’, has been a menace to the industry since its rapid expansion in the 1980s. There was no pathology, infection, or chronic inflammation to give indications of what caused the illness. Although the cause of this condition still remains a mystery, scientists have developed a solution to the problem which has dramatically reduced the impact of this disease. The research was initiated by Dr. Alvin Camus, previous director of the Aquatic Research and Diagnostic Laboratory at Stoneville. Dr. Camus demonstrated rapid recovery of anemic fish following injections with iron dextran. While the form of iron and delivery method did not result in a practical solution, the research demonstrated that fish were responsive to iron. This led to more collaborative efforts among Dr. Menghe Li, Experiment Station nutritionist, Dr. Lester Khoo, director of the College of Veterinary Medicine’s Aquatic Research and Diagnostic Laboratory, and Wise. Field trials were conducted to validate the use of ferrous sulfate, a mineral needed in the production of red blood cells, to promote recovery of anemic fish. As a result of this work, increasing the iron concentration in the diet has become common practice. Another example of collaboration led to the development of an effective vaccine against enteric septicemia of catfish. Experiment Station scientists developed a vaccine for oral delivery. Vaccination protocols were evaluated in small aquaria with exceptional results and immediately tested in small experimental ponds. “Although test results showed tremendous potential there was no practical method of mass production or delivery of the vaccine. This led us to seek out assistance from other programs within MSU and DREC campuses. The fermentation facility at the National Biological Control Laboratory, located on the DREC campus, mass produced the vaccine while the MSU Department of Agricultural and Biological Engineering developed a mechanism for commercial scale vaccine delivery. “These three components, developed in collaboration, allowed for a viable oral vaccination platform. This vaccination platform has tremendous potential in increasing the profitability of catfish farming,” Wise said. “It’s a classic example of how a concept is developed into a usable product benefitting producers. Initially vaccine and feed was mixed in beakers to conduct laboratory trials, then five-gallon buckets for testing in experimental ponds, ending in the development of a mechanized delivery system for large-scale field testing. The other part of the success story is that the National Warmwater Aquaculture Center derived the solution and we were able to roll it out almost immediately to the industry. We are servants of the industry and we are very proud of that. We never would have gotten to this point if we couldn’t use the commercial farms as an extended laboratory,” Wise said. This project re-emphasizes the importance of the relationship that faculty and staff in the National Warmwater Aquaculture Center has with farmers. The Center has three types of labs in their arsenal: analytical and wet labs, research pond facilities, and commercial ponds. Producer ponds are considered to be just as important as the wet labs and the ponds at Stoneville. That’s one of the reasons why this program is effective because in many cases results can be taken straight from research to the field. This flexibility keeps the Aquaculture Center very connected to the industry. It also helps participating producers understand and utilize the research. “We help producers clean up or rid their farm of problems while also evaluating the validity of our research. 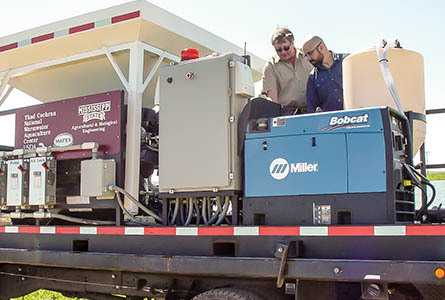 This program has been instrumental in developing feed formulations and cost-effective disease and production management programs currently used by catfish producers. Not to mention diagnostic and field services provided by the National Warmwater Aquaculture Center are free of charge,” Wise said. Focus: Research, extension, and diagnostic services with an emphasis on fish health management, profitability for farmers, and production efficiencies. Passion At Work: I am passionate about conducting research that has direct industry application and using this information to develop farm-specific management strategies to increase farm productivity and profitability.